We do our core business with sincerity and honesty. Nikkari’s mowers and monoracks were developed to reduce the labor of mowing in midsummer or carrying products in steep fields. Our company motto is “sincerity and honesty”. The motto shows our determination of putting our customers first, the actual users of our products. Ever since the foundation, we have conducted all of our business in a manner true to our motto. 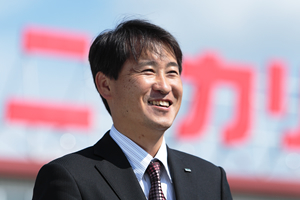 We aim to expand from Okayama, our birth place, to all corners of the nation and eventually throughout the world. We will continue to strive to develop products that meet our customers’ needs. We follow our moral compass in all our activities. NIKKARI CO., LTD. Has the ISO 9001 certification for quality management systems for its agricultural machines and mono rails which include peripheral equipment.